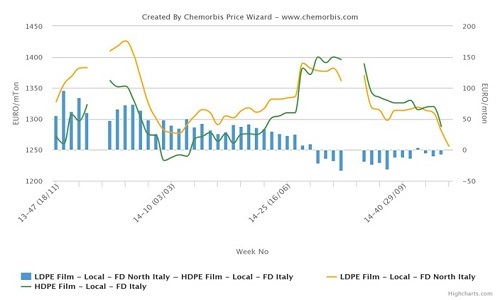 In Asia, PET prices recorded increases on the back of firmer upstream costs, which gained ground on the week as per the pricing service of ChemOrbis. Upstream costs are not only firmer on a week over week basis but they are also firmer when compared with end October levels. Price wise, spot PTA costs are $10-15/ton firmer on the week and they are $5-10/ton higher from the end of October. MEG costs are $45-50/ton firmer on the week and they are $75-80/ton higher with respect to the late October levels. For PX, prices are $50/ton higher from last week but they are still slightly down, by around $5/ton, when compared with the end October. These increases in upstream costs were tied to tight PTA supplies in Asia and concerns regarding MEG supplies. According to players in the region, a global producer nominated their December MEG contract prices with $60/ton increases from November, pointing to the short term supply and demand dynamics in Asia. Meanwhile, PX prices were also said to be pushed higher by the higher PTA futures prices. Coming to China’s PET market, the overall offer range out of the country tracked a stable to $10/ton firmer trend. Meanwhile prices out of Korea mostly retained their levels during this past week and inside China, the PET market gained CNY100/ton ($16/ton) on the week. 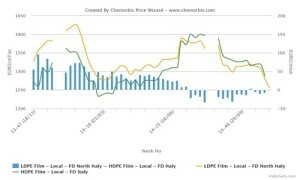 A Chinese producer offering at the low end of the range at the beginning of last week noted that they lifted up their prices by $40/ton towards the end of last week. Meanwhile, another Chinese producer, who was already offering at the high end of the range, reported maintaining their offer levels. “We heard that some local producers are offering discounts of $10/ton on their prices but the general market level on FOB basis is still around the $1100/ton threshold. Nevertheless, PET demand remains weak and continues to pose as a downward pressure point,” he further added. Other global markets, too, saw higher import prices from Asia. Turkish players saw up to $20-30/ton increases on Chinese PET prices while Egyptian converters faced up to $35/ton increases for Southeast Asian PET. According to ChemOrbis, players in these markets are also questioning the sustainability of these increases on PET prices. Pointing to the previous examples of prices moving back down after short-lived increases on PET costs, buyers do not appear convinced that the market has reached the bottom level. Many highlight the weak crude oil prices, although this situation might change if OPEC decides to cut production at their meeting on November 27. Plus, global PET demand is not very supportive of an increasing trend, most players highlight.